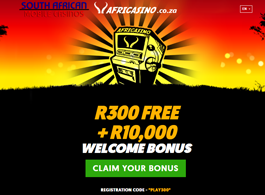 If you are looking for a brand new mobile casino that caters to South African players, then check out Africasino. Africasino is licensed and regulated by the Government of Curacao and is powered by multiple software providers including NetEnt and NextGen. The Africasino mobile site is easy to navigate with a crisp and clear design. The mobile site allows you to play all your favorite games from your browser, whether you are playing on your smartphone or tablet. There is a great range of games to play, they support ZAR and offer a great customer service. Africasino uses multiple software providers including NetEnt, NextGen, Betsoft and others. These top rated software providers mean that you will have smooth gameplay on your mobile device. The mobile version of Africasino can be played straight from your mobile browser. You will just need to visit the site in your browser on your smartphone or tablet. The menu is a simple drop down, which makes navigation on mobile simple and easy. The site has been well designed with touches of South Africa incorporated. You will easily be able to find the games you want to play whether it’s slots or table games. Tap the game, wait for it to load and start playing. All games offered are from reputable third parties that have their own auditing procedures and are independently accredited to ensure that games are fair and random. All personal and financial information on the mobile casino is protected with SSL encryption, so you can be sure you will have a safe gambling experience on the go. There are more than 250 games available at Africasino mobile from top rated software providers. You will be able to access the best and most popular games whilst on the move from your tablet or smartphone. There are a number of slot games at your disposal and you will be able to spin the reels on NetEnt Touch games. These games have been produced for mobile and offer seamless gameplay with amazing graphics and sounds. Games that you can find on mobile include Superman, Motorhead, Jewel Sea, Batman, Sunset, Guns N Roses and Jimi Hendrix. There are also a number of table games on mobile like blackjack and roulette as well as scratch cards and virtual sports betting. You will also be able to play live casino games on mobile where you will have the choice of roulette, blackjack and baccarat. This means, you can play against a live dealer whilst on the go. There are progressive jackpot titles that have been provided by Betsoft. There are 10 titles in total, which include Greedy Goblins, Glam Life and Mr. Vegas. These progressives are pooled across the casino’s network and is your chance to win big. Africasino is compatible on most mobile devices whether you want to play on your smartphone or tablet. The games have been optimized to work on these smaller screens to provide you with great graphics and all game features. You are able to play on Android, iOS, Windows and Blackberry devices from your mobile browser. You will not need to make any download in order to access the casino. New players at Africasino Mobile will be able to take advantage of the no deposit bonus. You are able to get a free R300 that you can use to test drive the mobile casino. To claim the bonus, you will need to register at Africasino Mobile, verify your email and then enter the code PLAY300. The bonuses continue during your first three deposits. The first deposit will give you a 300% match bonus for up to R6,000 plus 20 zero wager free spins. The second deposit will give you a 50% match bonus for up to R1,000 plus 50 zero wager free spins. The third deposit will give you a 100% match bonus for up to R3,000 plus 30 zero wager free spins. The deposit and bonus will need to be wagered 30x before any winnings can be withdrawn. If you no longer want to be part of the bonus, you are able to opt-out by contacting the support team. Other bonuses and promotions include an Enhanced High Roller bonus, Selected Payment Method bonus and a Friday Happy Hour bonus. There is also a 4 tier VIP scheme that offers weekly bonuses and promotions depending on your VIP level. The first level is Bronze and when you go up a level, you will receive a one-off gift. Each time you place a wager on mobile, you will receive Cash Points, which can be redeemed for cash. The amount of Cash Points, you earn will depend on your VIP level. Africasino has made it easy to make deposits and withdrawals on mobile. You have a choice of banking methods that offer safe and secure deposits and withdrawals. If you would like to make a deposit, you can do so via Neteller, Skrill, EasyEFT, ecoPayz, Visa and MasterCard. All of these methods are safe and offer instant deposits, which means you will be able to start playing a lot quicker. Withdrawals can be made with Visa, Wire Transfer, Skrill and Neteller. Withdrawals usually take between 2 and 5 days depending on the method chosen. Customer support on Africasino Mobile is friendly and knowledgeable offering you help 24 hours a day 7 days a week. The mobile version does have an FAQ section where all the most common questions have been answered. It is then a good idea to first go through this section, before contacting the support team. If you need to contact the support team, you are able to via email and live chat. Live chat can often generate instant responses and they reply to emails quickly. You can also request an instant callback on mobile, where the casino will call you about any question or query you may have. Africasino might be a newer mobile casino, but it is already apparent that this casino is trustworthy and reputable. The casino offers games from some of the top software providers, which allows players to play only the best games on the market. The range of NetEnt Touch games means that you will be offered amazing gameplay when spinning the reels. The mobile casino caters to South African players and uses ZAR, so players do not need to worry about exchange rates when making a deposit or withdrawal. You are able to test the casino first with the no deposit bonus and the generous welcome bonus will have you playing for hours. The site is easy to navigate on all mobile devices and sign up is quick, easy and painless with all your information being protected. Africasino is a great entry into the South African online casino market and offers something for every type of player.